Raise your hand and cover your mouth if you’ve ever dreaded a trip to the dentist. If you’re like 60% of the population, you just raised your hand. More than half of us have some amount of dental anxiety. Not surprisingly, your child might be afraid of the dentist, too. Allowing this fear to continue or get worse can adversely affect your child’s oral health for decades to come. Indeed, nearly 20% of children under the age of 18 have untreated cavities, and fear is reported as one of the major reasons why they are left untreated. Luckily, dental anxiety can be overcome! We know you love your family dentist. We also understand the temptation to start taking your kids there. After all, you know the office, you feel comfortable there, and you know they accept your insurance. However, they don’t have the specialty training a pediatric dentist does. Pediatric dentists study an additional two years beyond dental school to study developing mouths in depth. In addition, during this time they study all stages and aspects of child development, so they understand how to support children and adolescents emotionally during dental visits. Finally, pediatric dentists will use kid-friendly terminology to help reduce their fears. In short, a pediatric dentist is the best start for your child because they specialize in treating kids, not just teeth! 2. Create positive dental stories as a frame of reference. As you know, kids look to adults to learn about their world. You can help your child develop a more positive attitude towards the dentist by sharing positive stories with them. For example, make sure you share your positive thoughts about going to the dentist before your own visits. Talk about how you can’t wait to have clean, sparkly teeth! Mention how it “tickles” when you get your teeth cleaned and how nice your dentist is. At the same time, keep your fears and dread to yourself. If you’re positive about your dental visits, you’ll teach them there’s nothing to fear. 3. Get kids comfortable with people looking in their mouth. Count Each Other’s Teeth: This game is just what it sounds like. Ask your little one to open wide while you use the end of a floss stick to touch each tooth and count out loud. For even more fun, open YOUR mouth and let them count your teeth when you’re done! Play Dinosaur or Shark: In this game, see how wide your child can open his or her mouth. Tell them you’re playing dinosaur (or shark or big mouth bass, you get the idea). Then suggest that a dinosaur can open their mouth for a long time. Ask them if they can hold their mouth open for a count of 20 like a dinosaur! Or for another variation, play along with them to see who can keep their mouth open longer! 4. Visit the dentist when no work needs to be done. Most pediatric dentists will welcome kids to visit the office for a tour or a preliminary consultation before any work needs to be done. Such a visit will go a long way to reassure your child that the dentist’s office is a fun place and the dentists are friendly people, rather than scary doctors in masks. Give them time to see all the fun toys they can look forward to playing when they come back for their next visit. 5. Show up early for dental visits. Dental anxiety is a form of stress. When children are stressed, they need more time to calm their fear response system down. Rushing in only a few minutes before your child’s appointment means little time to focus on their stress level. Likewise, you’re likely to be more stressed and distracted, too, if you’re trying to get all your paperwork done before your child’s name is called! How much time is enough time? You know your child best. If 10 minutes is all they need to read a book and look around to calm down, great! Other children, though, may need more time. They may need 20-30 minutes to tour the facility again, go to the bathroom, and cuddle on mom’s lap with a book before they feel calm. No matter how long they need, try to give it to them by arriving early. 6. Schedule (and keep!) regular appointments. The more familiar something becomes, the less fearful it remains. Thus, a major way to help your child overcome their dental anxiety is simply by ensuring they see their dentist regularly. Moreover, regular appointments will reduce the chances that more invasive dental work ever becomes a necessity for your child. In other words, more check-ups mean less dental work for fewer potential negative experiences at the dentist! 7. 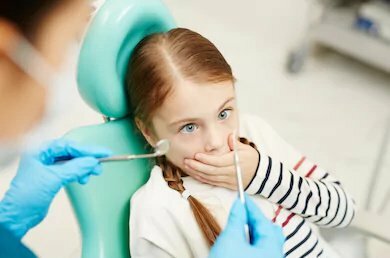 Tell your dentist about your child’s anxiety BEFORE you visit. Pediatric dentists want kids to enjoy coming to the dentist. The more we know about your child’s needs, the better we can meet them! We’ll also be able to schedule additional time to help give your child a more relaxed experience while at the dentist. 8. Let the dental team do the talking. 9. Focus on the positive after dental visits. No matter how the child behaves or what information is learned at your child’s dental visits, only focus on the positives. Find what they did well. For instance, did they play nicely in the waiting room with other children? Did they remember to thank the dentist or assistant who helped them pick out a prize at the end? No matter how small the victory may be, celebrate it! In doing so, you’ll be reassuring your child that they can have successful dental visits! 10. Put your own fears of embarrassment aside. Dental professionals see fearful patients every day. We’ve seen patients cry, vomit, yell, and refuse to cooperate. We’ve also seen parents unwittingly make the situation worse by worrying about what we’re going to think about the patient–or them–based on such behavior. Please rest assured that we understand it’s the dental anxiety talking, and not a reflection of your child’s true nature or your parenting! If you find it hard to be in the room when your child is struggling with a dental visit, make an excuse to leave the room! We’ll support your child while you’re gone, and you’ll know you’re helping by keeping your own emotions in check during that stressful time. We have additional ways we help children overcome their fear of the dentist! At Great Beginnings Pediatric Dentistry, we have additional technology and practices that help banish kids’ fear of the dentist! Laser Dentistry: This innovative technology is virtually pain-free and reduces the need for needles! SDF Treatments: We can arrest some decay without any drilling or laser at all with SDF. Learn-See-Do Approach: In our open hygiene bay, we make sure kids learn first by watching others. Screens Over Every Chair: Kids can distract themselves with their favorite movie while we work. Dr. Laura Adelman, DMD and Dr. Rachel Rosen, DDS are pediatric dentists with over 25 years of combined experience treating children with dental anxiety. They are taking new patients under the age of 12, and invite you to bring your child–anxious or not!– for a visit to their office just over the Solon, Ohio border in Twinsburg. At What Age Should Kids Brush Their Own Teeth?